The 2016 Season in review from the eyes of the winemaker. Starting in the vineyards, working all the way through to the glass and your mouth! This is Not Just a Wine! This is 28 years in the making! I’ve made 100’s of wines, this is only the 2nd to be released under my own label. Just a little bit excited  Explore below for all the juice on making, the style &amp; what’s next! Thanks to all the friends who helped make this possible! I have tasted 3 wines made by different makers from the same Shiraz. All show characteristics of the site, yet they are incredibly different. The fruit was picked at the same time so this difference can only be the winemaker’s choices. On the spectrum of delicate to bold, the Wine Decoded Shiraz rests in the middle. Dark fruits, vibrant mulberry, liquorice, brown spices, and a hint of pepper lift from the glass. There’s a density and richness, yet vibrancy to the fruit. We’ve ended up with sophisticated, chewy, layered tannin. Stalks, a portion of whole bunches, and, a splash of oak all contributing. Post vintage, I felt like I’d just managed to tame a wild beast! Secondary, earthy, &amp; faint truffle notes along with mid-palate generosity are building with age. The extra time in barrel &amp; tank, 25 months, and, another 12 in bottle before release has been well worth it. A short amount of time makes such a huge difference to young wine. We share with you a wine, that drinks beautifully now. It’s made it through puberty and into early adulthood in our hands. Take some time with your first bottle, open it and take a glass a night for the first two nights. You’ll see how it opens up sharing its full self with you. It will continue to build intrigue, and, personality over the coming years. Secondary characters will continue to layer in over time. You can “Follow the Grapes through the Eyes of the Winemaker” in the Wine Bites Mag articles about the making of the wine! You’ll find loads of videos taking you from vineyard to bottle. A big shoutout to Stuart Proud for growing some superb fruit at his Syme Vineyard in Seville East, Upper Yarra Valley. Thanks to Dylan & Dominic at Seville Estate for helping destem our fruit. To all those how were part of the making process, Maree, Genevieve, Ken, Alfonso, Emma, Margaret, Eddie, Shane, Tresna, Stuart M. & Carolyn . Throughout the years I have had the pleasure of working with some of the most passionate, knowledgable people in the industry. Steve Webber from DeBortoli along with Dave Bicknell, now the madman in charge of Oakridge were there for my first vintage, Bailey Carrodus, my 2nd, 10th-12th vintages, Tom Carson for my 5th-9th, Alex Moreau for a fun stint in Chassagne in the middle and many more. It is with great pleasure that I share our 2nd release, the 2016 Wine Decoded ‘Bathtub’ Shiraz with our community today! Making wine from grapes you’ve never worked with before is always novel. I would say that it takes 10 years to truly get your head around a site and it’s fruit. By then everything changes. The climate, vine age, your winemaking experience and philosophy. In the back of my mind were all the things I love in good wine. Elegance, sophistication, complexity, graceful texture, balance, freshness. Above all wine with personality! The end result is a wine that reflects, the site, the vintage(s), and, the maker. The concept of ‘Terroir’ for mine must include the hand of the maker. Maker’s must choose the path the fruit travels, the options are endless. Current fashion leans toward single site wines, from single vintages. Yet, throughout history, some of the greatest wines made are blends from multiple sites, regions separated by hundreds of kilometers, and, multiple vintages. Think Rinaldi & Bartolo Mascarello in Barolo. Many Australian blends like Penfolds St Henri. Champagnes made with reserve wines based on a Solera System blended across many sub-regions. Current labeling law requires a component of a wine only be mentioned when it is greater than 15% of the blend. You might be suprised at what actually is in a single site, single vintage wine! There is a secret ingredient in the 2016 Wine Decoded Shiraz. 7.5% of it is from the 2017 Wine Decoded Shiraz. Why? The blend made for a better wine, a more complete wine. 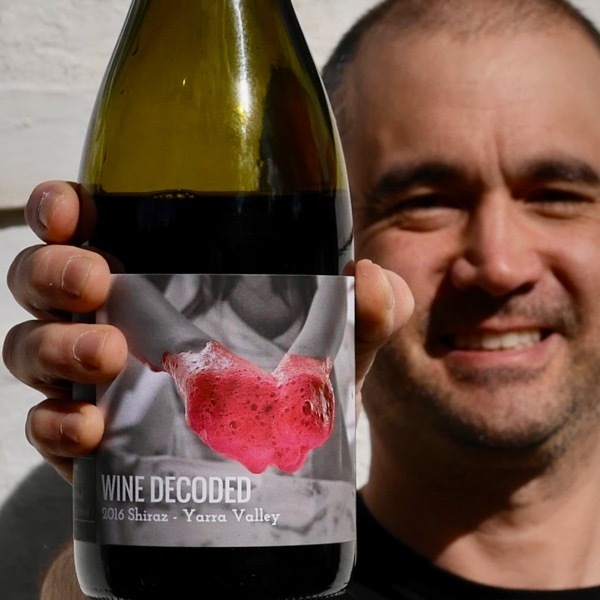 Equally the 2017 Wine Decoded Shiraz is blended with 12% of the 2016 wine. We played around with these blends across 3 months before locking them in! The addition of 7.5% 2017 Shiraz to the 2016 added freshness, mid-palate vibrancy and took the edge off the tannins. The addition of the 12% 2016 Shiraz to the 2017 layered in complexity, earthiness and layered in some tannin in the right spots. Both were better wines for the blend. Just like Giuseppe Rinaldi we have made wines that are more complete by blending. Decanting recommended. I made a rookie mistake, late blending of the 2017 in the 2016 resulted in some wine diamonds forming in bottle. They’re completely harmless and settle out very quickly. You’ll get a bit in the last glass if you don’t decant it. Clonkilla’s current release Hilltops Shiraz has the same amount of tartrate, as does Sandrone’s Barbera. Winner – Vineyard of the Year, 2018 Yarra Valley Wine Show! We’ve been lucky to have Stuart Proud working hard to sustainably grow our wonderful Shiraz fruit. We did an interview with him a while ago that you can watch here. Wine Decoded hits the Vineyards to talk soil, grapes and vino with Stuart Proud, grower of Wine Decoded’s Bathtub Shiraz Grapes! Look out for wines from this vineyard. Wine Decoded’s and others will be hitting the site soon. 2016 was a warmer compressed year. Sugar accumulated ahead of flavour, and, to ripe levels before the tannins were ripe. Many vineyards were water stressed. Picking was a real balancing act between keeping the potential alcohol under control and getting ripe flavours and tannins. Fortunately, Stuart’s work with the soil saw our vines holding up well under the conditions. Every year we share our passion for wine, making it, talking about it, most importantly sharing it. This is a passion project, made, by hand with Friends! The label for each wine we make reflects this. This year, the label shows Genevieve’s hands covered in pink foam from the fermenting Shiraz. Each day during vintage the kids are in the winery with us experiencing and playing as we make our wine. Why hands? Our wines are made with touch, the detail we apply in making them, and, minute scale, mean it is both necessary & pleasurable to work by hand! The Wine Decoded ‘Bathtub’ Winemaking Project continues. We have secured some exceptional Shiraz, grown by Stuart Proud, at the Syme Vineyard. The 2017 was bottled in September of 2018 and is resting in bottle until we’re ready to release it! Read, watch, and, listen to more of the Bathtub Winemaking Project in the Wine Bites Mag.